Oh my goodness. 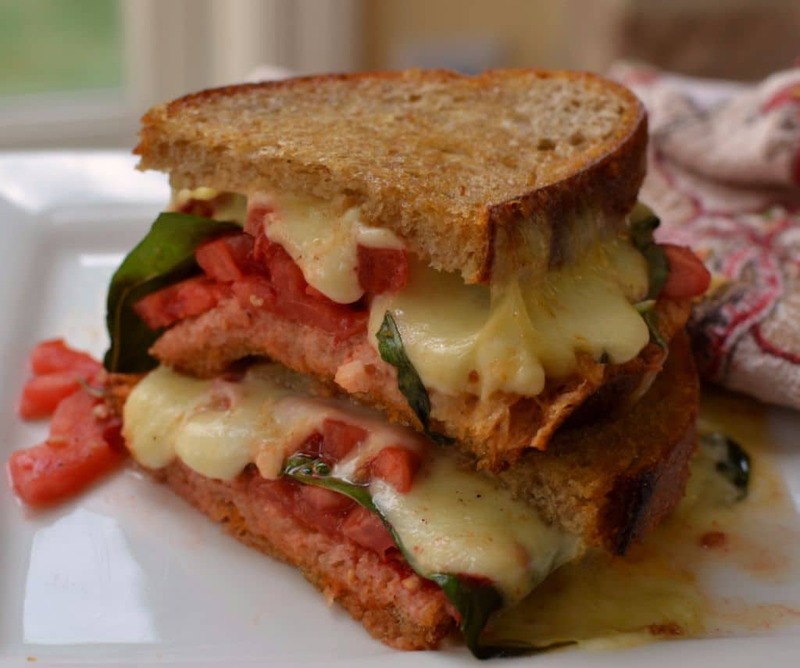 This Caprese Grilled Cheese is one of the best I have ever had or made. Believe me because I know my grilled cheese! 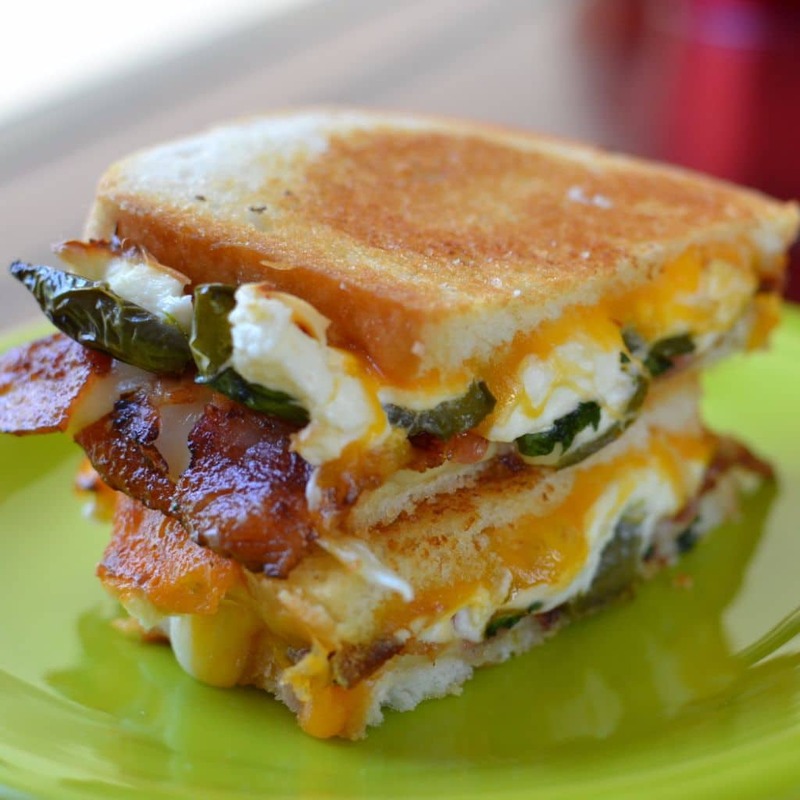 Grilled cheese has got to be one of the absolute best comfort foods known to mankind. I think even more so than mac n cheese. It is hot here….so very hot. But one good thing about hot weather is that is produces great tomatoes. Tomatoes are packed full of beneficial nutrients and antioxidants and are a rich source of vitamins A and C and folic acid. 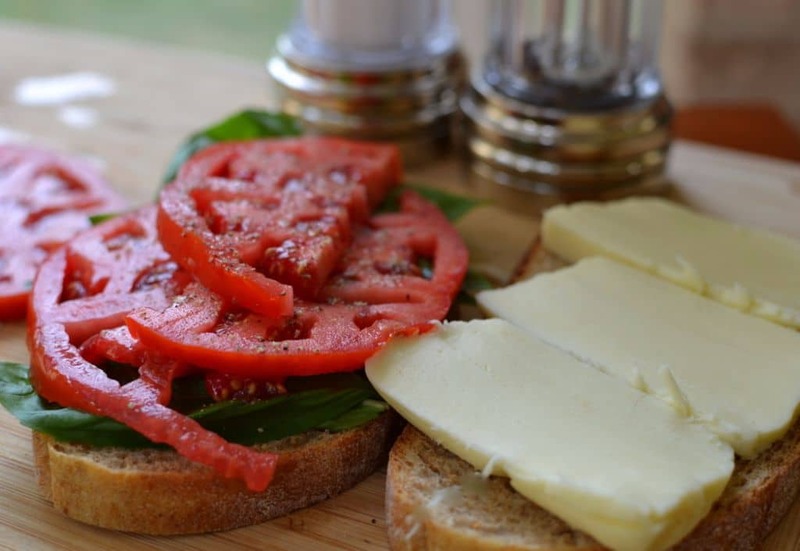 That combined with garden fresh basil takes this Caprese Grilled cheese to heights I never thought possible. Did you know that basil is as a natural anti-inflammatory? Now make sure that you buy yourself some bakery quality bread. This was a European wheat loaf from a high end grocery store in the area. Don’t skimp on the bread. 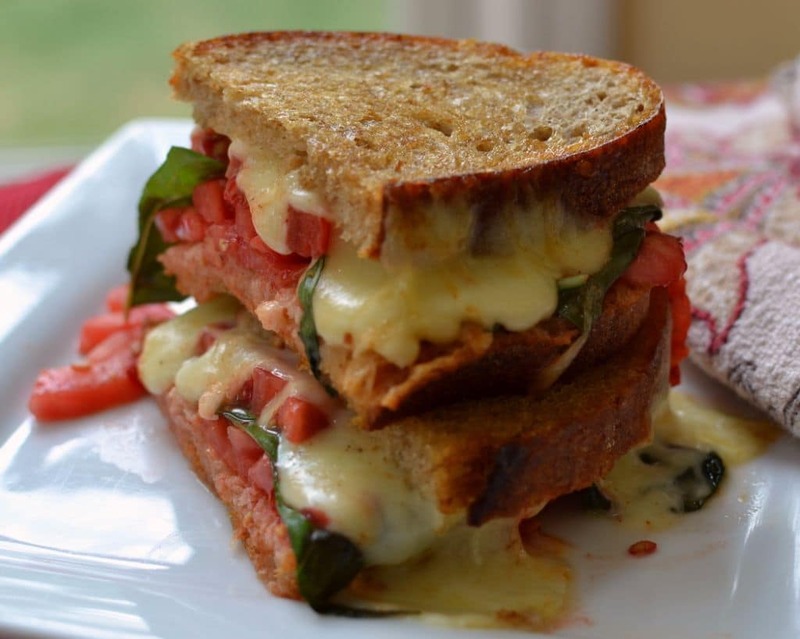 I simply love this grilled cheese and I hope you do too! Place balsamic vinegar in small bowl. Slowly whisk in olive oil. Add minced garlic and pepper and whisk for 30 seconds. 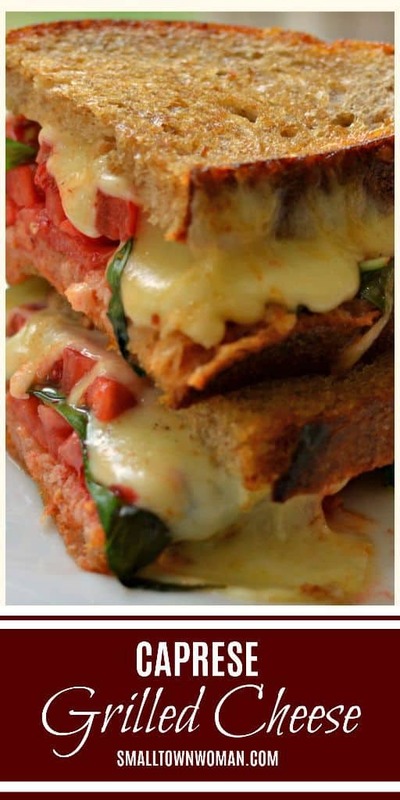 Layer two slices of bread with mozzarella slices. Add two slices tomato on top of the mozzarella. Now layer basil leaves on top of the tomatoes. Season with salt & pepper to taste. Top each with other slice of bread. Spread the top slice with butter and place butter side down in skillet over medium low heat. While in pan spread the other side with butter and cover loosely with foil. Grill until golden brown. Flip and grill the other side until golden brown. Serve immediately. What do you do with the balsamic vinegar mix for the 1st grilled cheese? The balsamic vinegar is a dipping sauce for both grilled cheese. The 2 sandwich recipes are great! Thanks so much! So glad that you liked them!! looks like you added bacon to this sandwich?? That would be something I would do anyway…… love bacon on a sandwich. I love bacon too but I did not add it to this one! Sounds like a great plan!! I’m not sure about adding basil leaves, but it sure looks good and I grow my own so I will try it. Sounds like a plan. It really is delicious! Maybe you could use pesto, put it on the bread before the cheese. Yes you could use pesto as well. That would be delicious! Looking delicious I would definitely add Bacon, Bacon, Bacon and fresh ground Pepper. That is all. Yes I love bacon too! So delicious!! I live in a small town and don’t know where to find that bread. Do you know any grocery chain that might sell that bread? I don’t have any problem with the cost, just want the bread. I purchase it from a high end grocery (local chain) here in the Midwest. I do know the Walmart bakeries around here sometimes really have good looking loaves of bread. If you live in or around Missouri send me an email [email protected] and I will give you the low down. 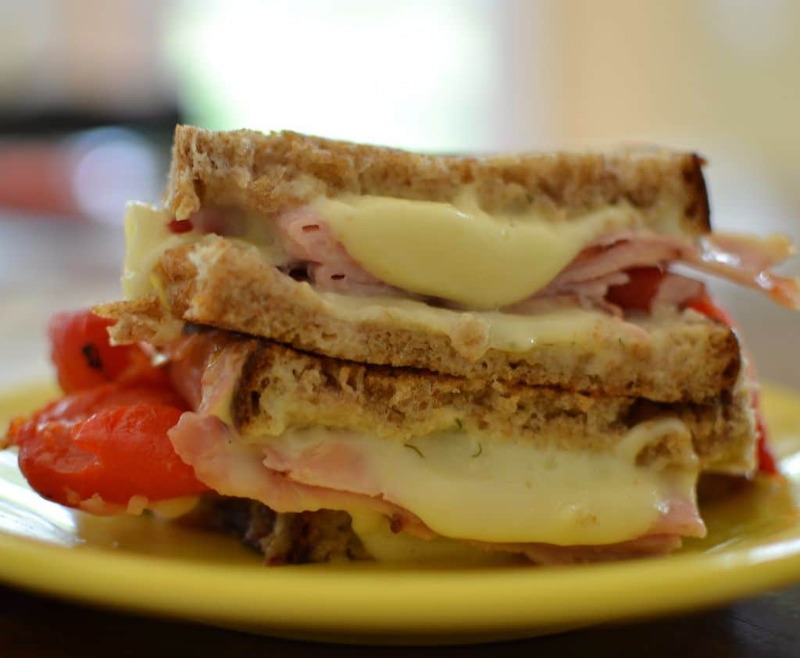 Is that Fresh Mozzarella or regular Mozzarella on the sandwich? Judy it is semi soft mozzarella not like the string cheese kind. I hope that helps. ALL the stare! Delicious! The dipping sauce isn’t optional! Thanks so much! Yes I love the dipping sauce as well!